The first smartphone from the J series for 2017, packs big things under its hood. A 5-inch display, faster LTE connectivity, upgraded battery and front camera with flash for selfies. A ton of improvement was added from the previous entry-level Galaxy J series phones. Now it has a 5-inch display that allows you to stream or make a video call with more visibility. The rear and front camera both have an aperture of f/2.2 which should give you good pictures even in low-light conditions. J2 Prime's front camera is also equipped with a flash that adds glam to your selfies. The front flash also helps the camera to easily focus on. Girls will find a good companion when doing make up on-the-go. The Galaxy J2 Prime is equipped with a 2,600mAH battery. You can turn on the Ultra-Power Saving feature to make it last longer and still use the call and text function when you need it. Samsung also packs the J2 Prime with upgraded LTE, now Cat.4, which ensures fast internet browsing so that your friends will quickly get updated when you post pictures, update your status online or when you live stream your activities. 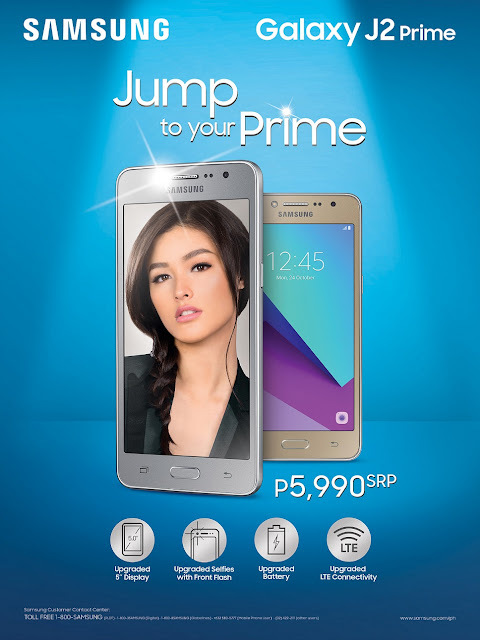 Reasonably priced at P5,990 SRP, you can go ahead and easily jump to your prime with the Samsung Galaxy J2 Prime!